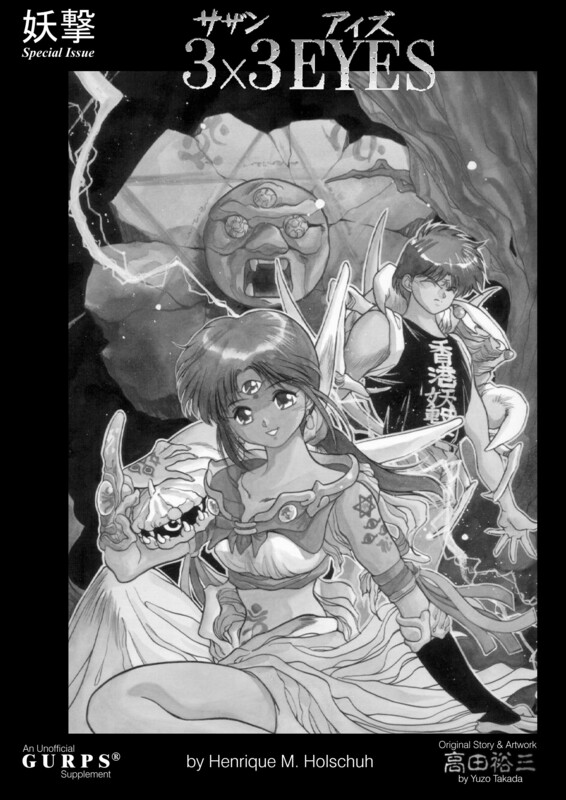 Here you will find available for download a set of files containing RPG rules and setting information for Yuzo Takada's great manga "3x3 Eyes". The rules were built using the GURPS® system, therefore some of the core GURPS rule and expansion books are required for playing. Please have a look at GURPS Lite if you don't own the GURPS Basic Set. On the other hand, if you'd rather play using the HERO system instead please proceed to 3x3Eyes HERO. This is an unofficial RPG. It was made by fans for fans, without the consent or knowledge of Yuzo Takada or any of the other copyright holders. This RPG was made, and is distributed, for personal use only. It cannot be distributed for profit or included in any distribution media other than the Internet or private BBS systems. This RPG cannot be distributed on printed matter. You are allowed to print a few copies for personal use of your RPG gaming group only. There are rumors of at least one official 3x3 Eyes RPG, available in Italy. If you can read Italian, it would be a good idea to look for it and buy it. Although I have not had any contact with that book, it may have interesting setting information with direct input from Yuzo Takada. 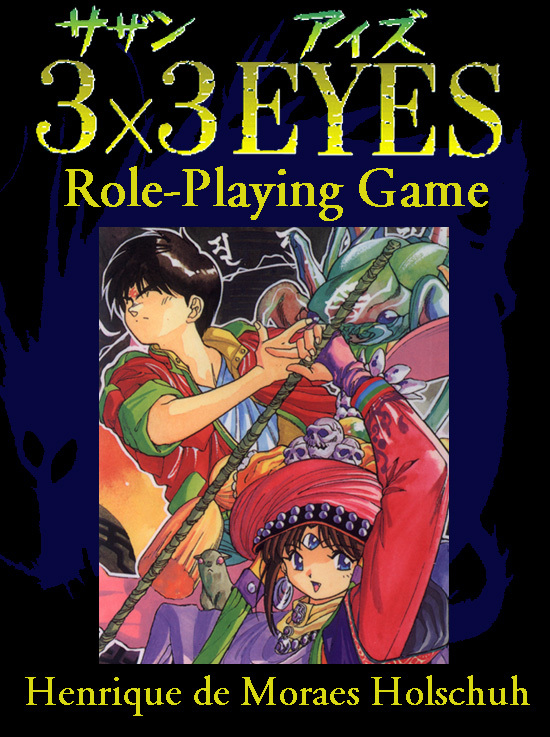 I am not aware of any official 3x3 Eyes RPG in English, and I do not know of any plans (not even rumors) to produce one. Constructive comments and criticism are welcome, you can reach me at henriqmh@dca.fee.unicamp.br. Flames will be redirected to /dev/null were they belong. I have a PGP public key if you want to keep it private. You might also be interested in some related links. 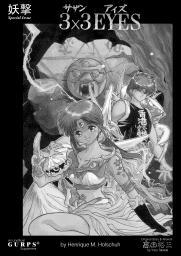 The RPG is composed of four core files, plus two additional files containing synopses of the 3x3 Eyes Manga and OAVs. For now, only a ISO text file version is available. The other file formats will only be available for the final release version, if they are made at all. This is a draft version, and as such is still undergoing playtesting. Unexpected changes may happen to GURPS rules in future updates. A few sections that are not finished yet were not included in this release. Yes, I am still alive. The RPG is being (slowly) worked on: already many small mistakes have been fixed and a hypertext (XML) version of the RPG is 90% done, from which HTML and PostScriptTM versions will be generated. The missing sections will be written as soon as the hypertext conversion is completed. If you have comments and requests, now is the time to send them in.. I can be reached at henriqmh@dca.fee.unicamp.br. Main Index, introduction to the RPG, GURPS and 3x3 Eyes, copyright information, overview and other miscellaneous introductory information. Contains only very minor spoilers. Setting description for the main 3x3 Eyes character archetypes: Sanjiyan Unkara, Wu and Demons, and other related information. The beast magic and Chinese paper charms magic systems for GURPS, 3x3 Eyes magic setting information, familiars and other magic-related information. Contains major spoilers. Campaign guidelines and play balance issues, adventure seeds, sample character sheets and familiars, Internet resources. OAVs 1 to 4: Synopses of the first four 3x3 Eyes OAVs. Pseudo-OAVs: Synopses of volumes 2 to 5 of the 3x3 Eyes manga. Originals available at The Anime Web Guide. This cover was a gift from Miko <akane89@yahoo.com>. The title logo was done by Fred Gallagher, based on original 3x3 Eyes artwork. The center picture is a scan from the 26th 3x3 Eyes Tankoubon and the backdrop picture is a postprocessed scan from another of the 3x3 Eyes Tankoubon done by me. This is my own design for the cover of the RPG. It uses the same 3x3 Eyes logo from Fred Gallagher as Miko's, and the main picture is a scan from the 3x3 Eyes Calendar of 1995. The kanji in the top left corner read Yougeki, and its meaning is left as an easy exercise to the fans. This cover is better suited for printing than Miko's due to the higher resolution. Steve Jackson Games, Inc. has published the boiled-down "essence" of GURPS in a 32-page booklet which is available for downloading. With this impressive booklet and the files in this page you will be able to play limited 3x3 Eyes adventures (without too much magic, as there are not enough spells in Lite). Also, Lite should help people to learn GURPS faster as well as being a rather nice way to "try it before buying".